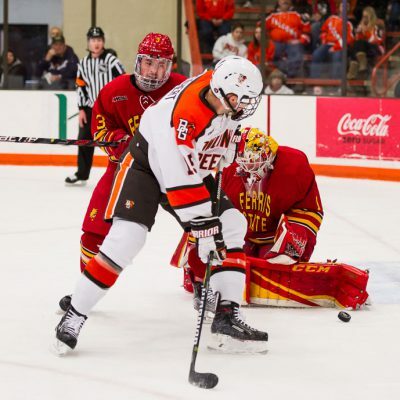 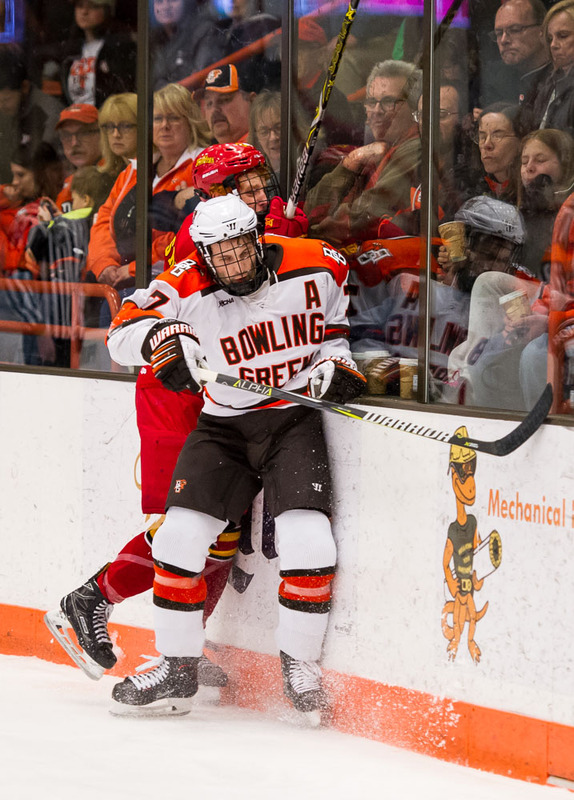 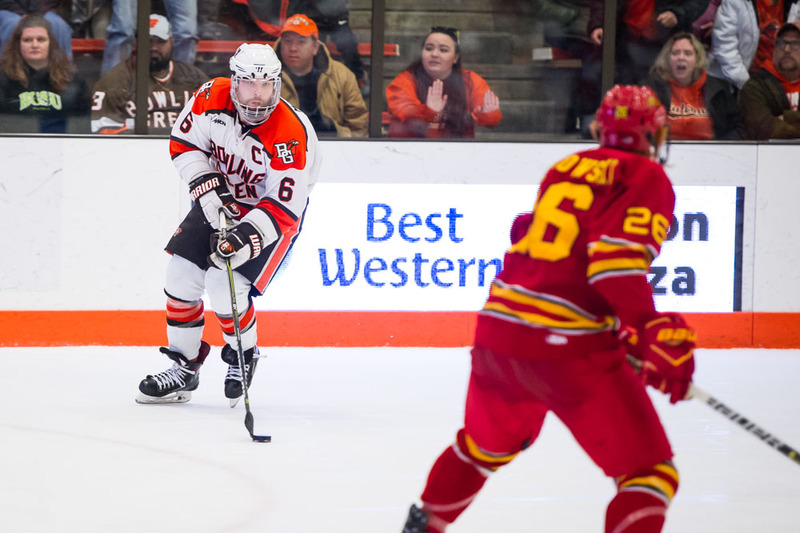 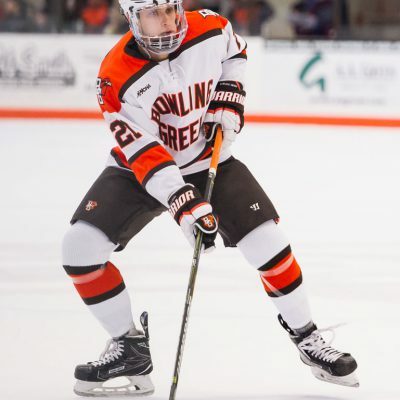 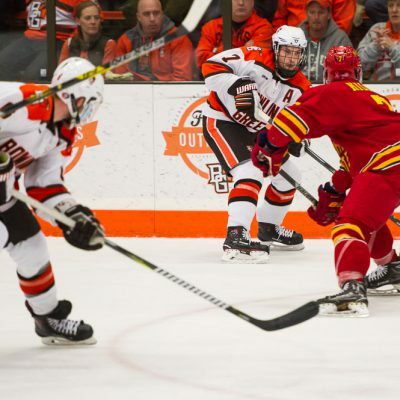 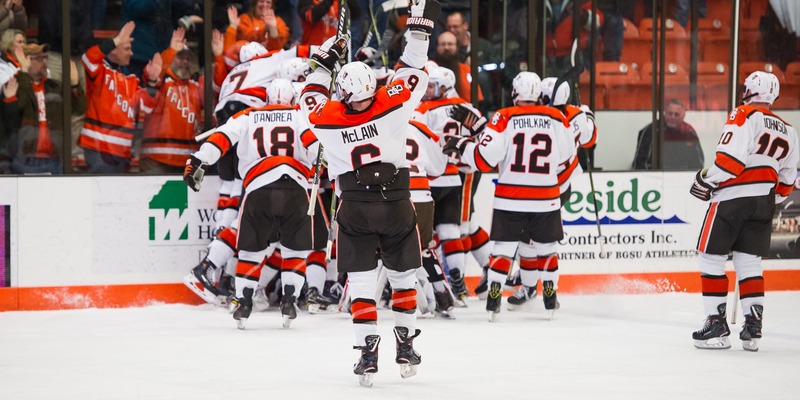 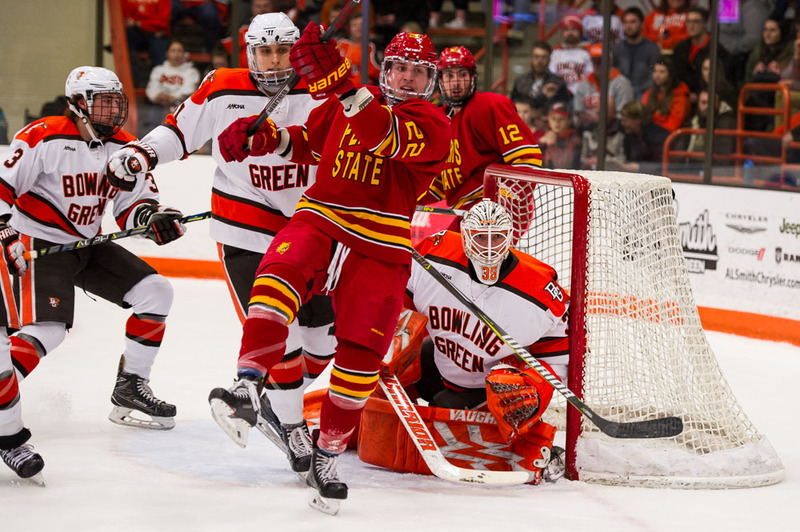 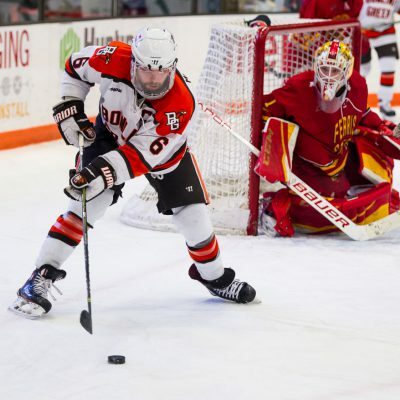 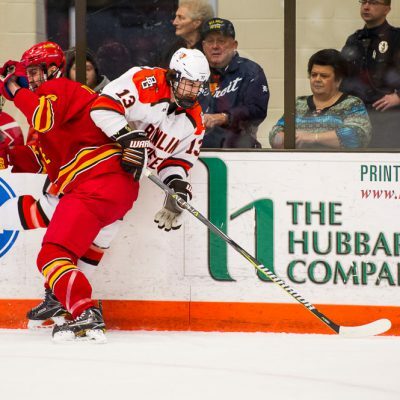 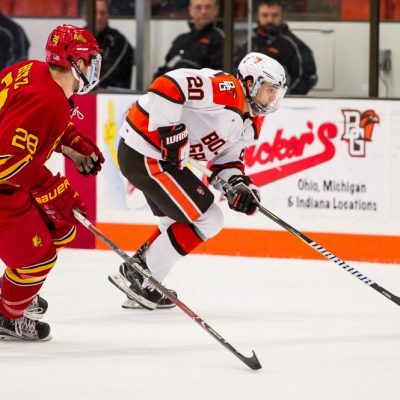 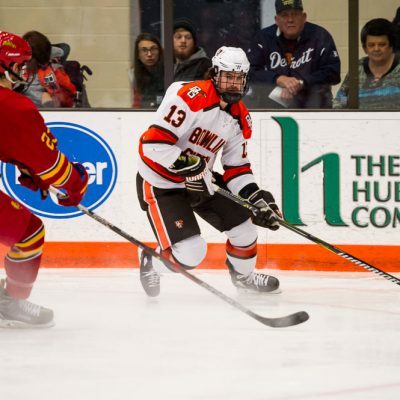 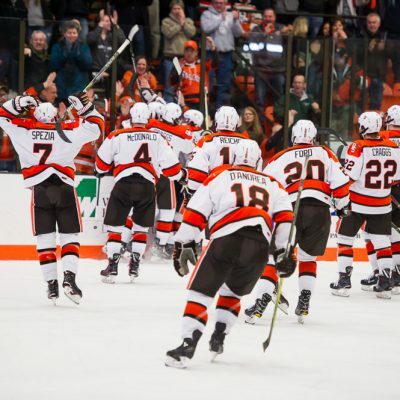 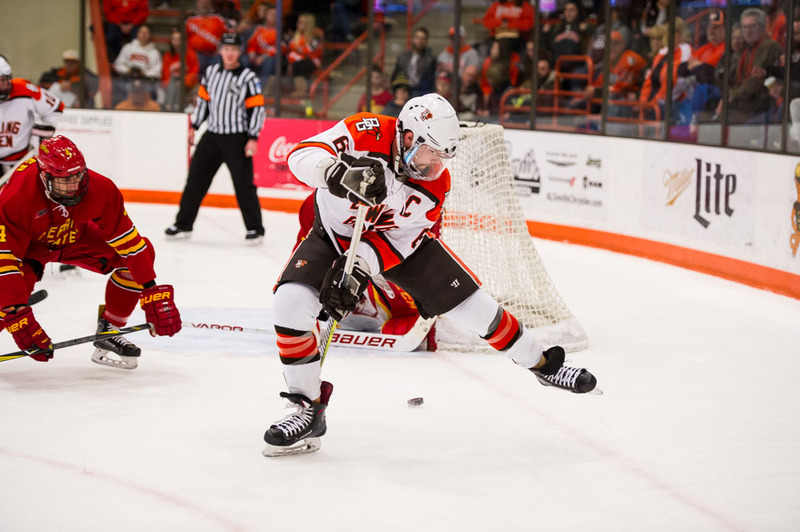 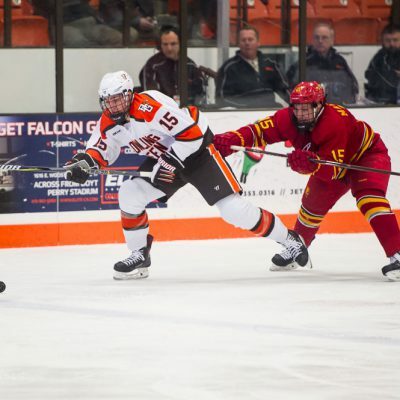 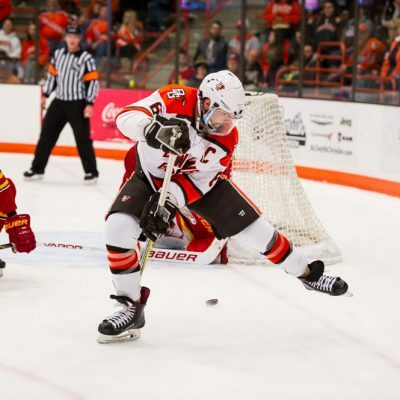 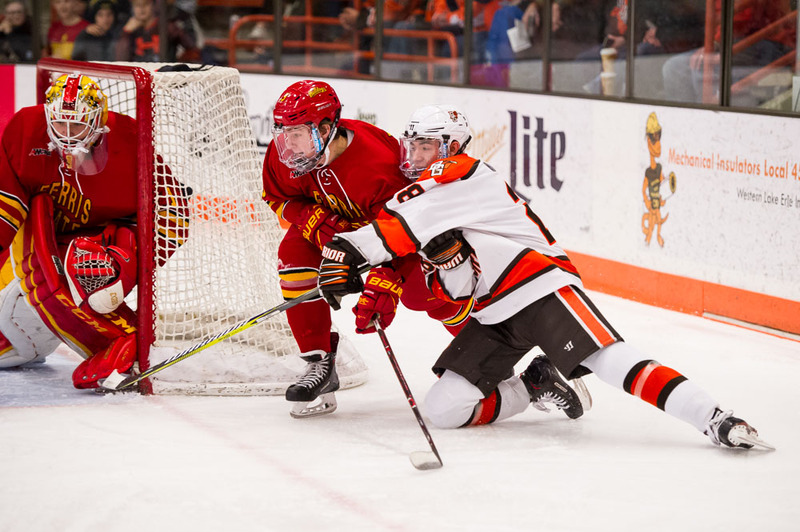 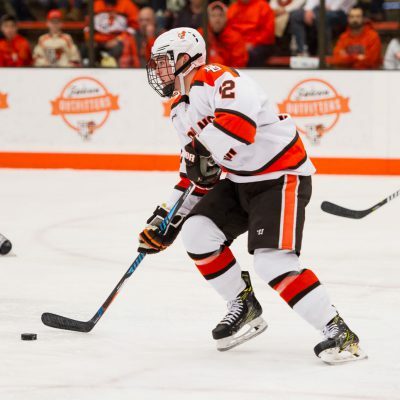 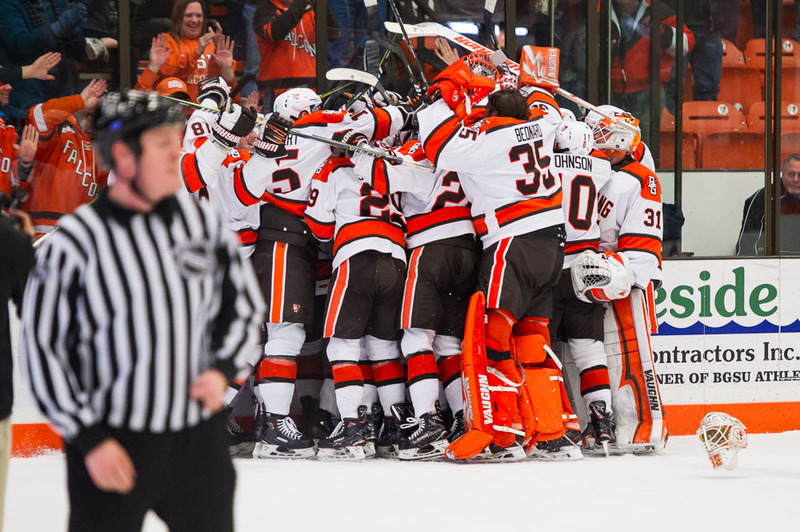 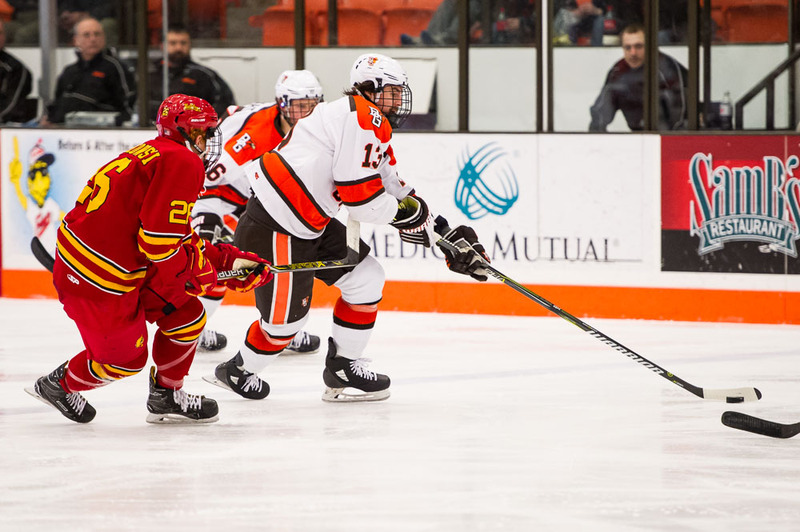 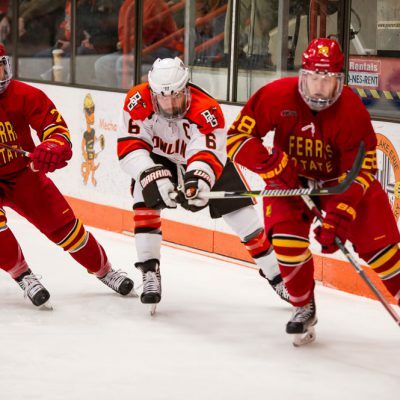 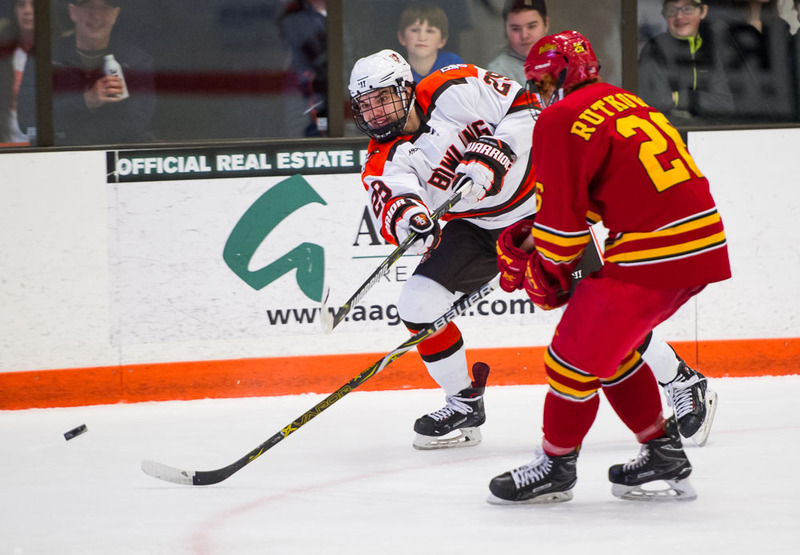 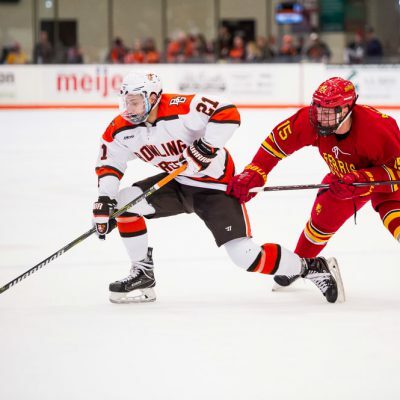 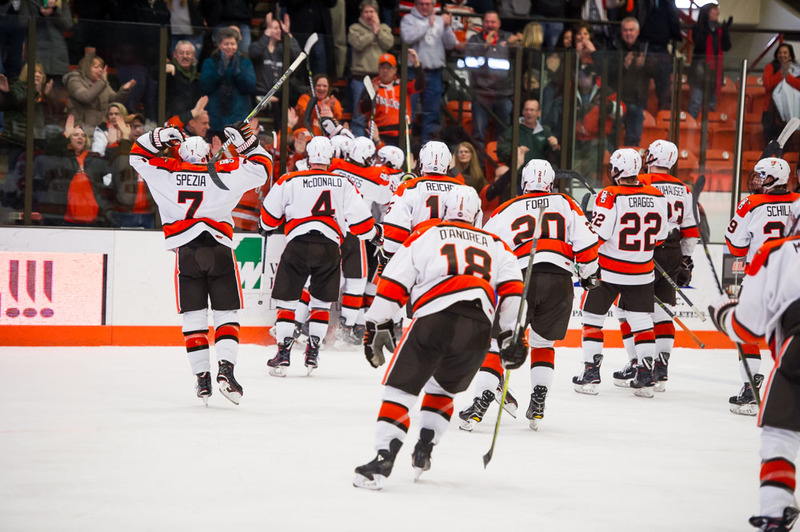 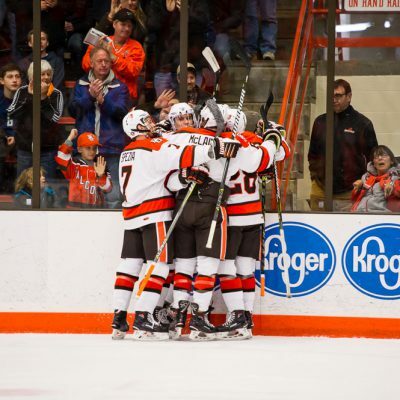 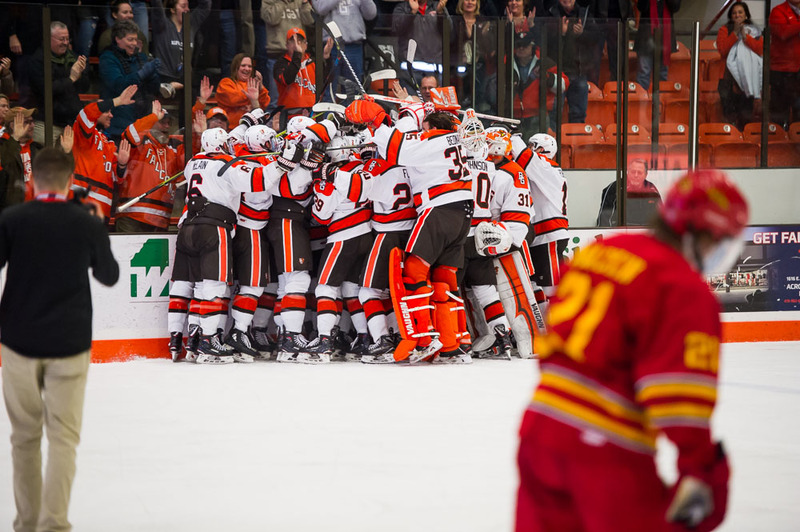 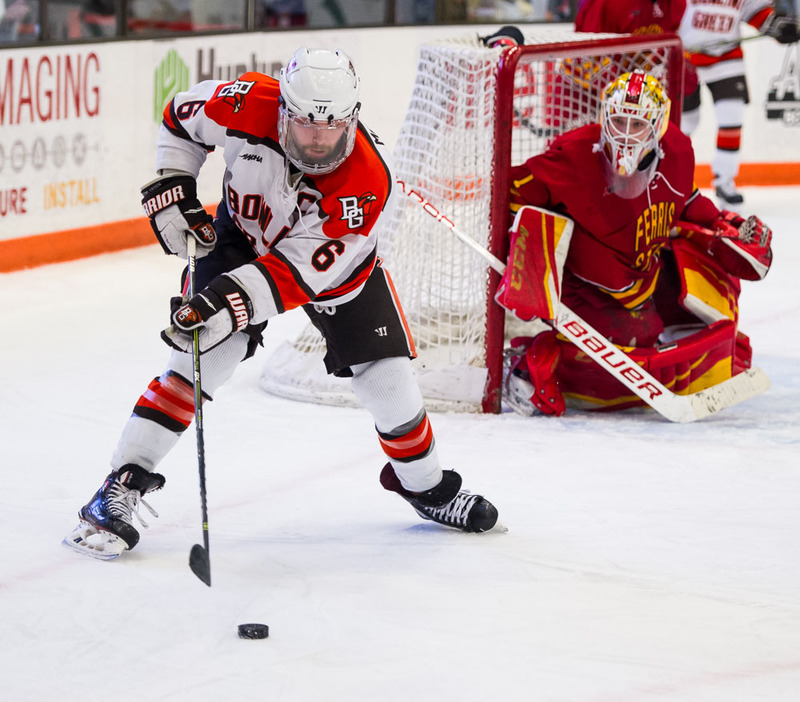 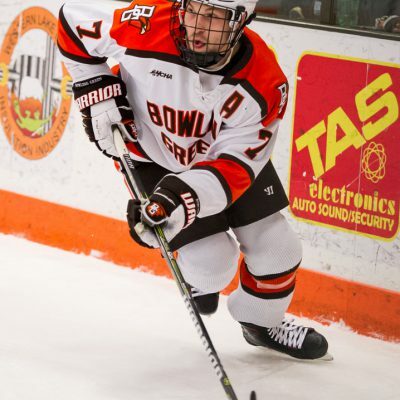 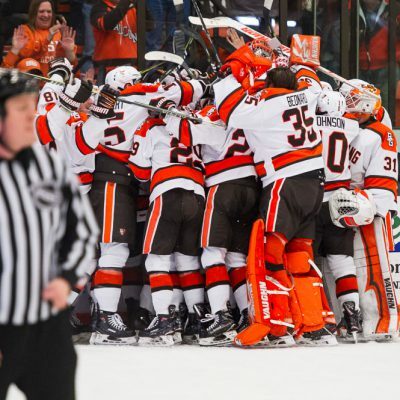 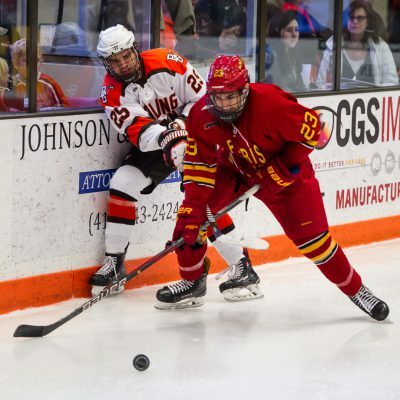 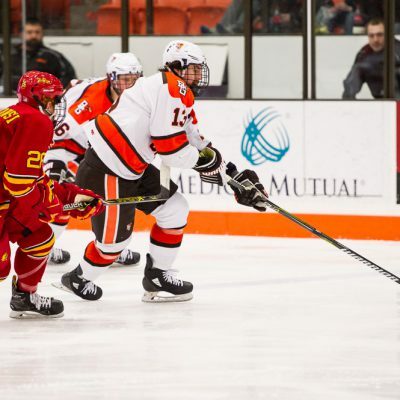 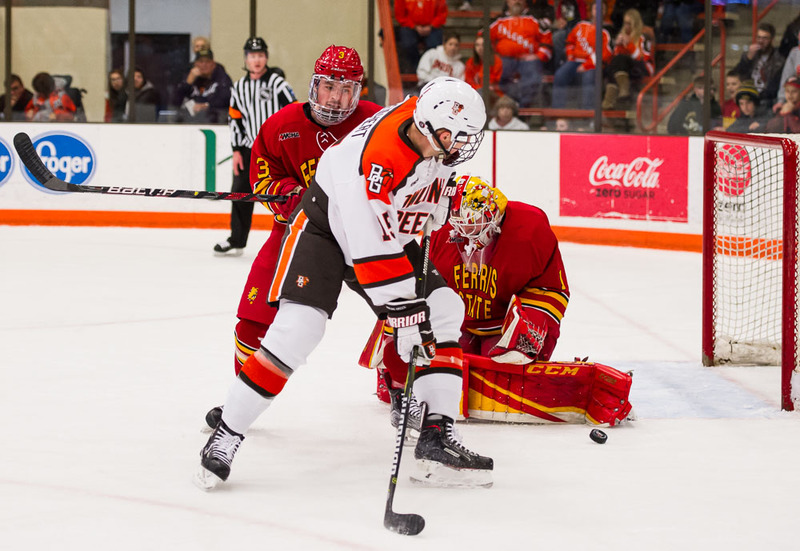 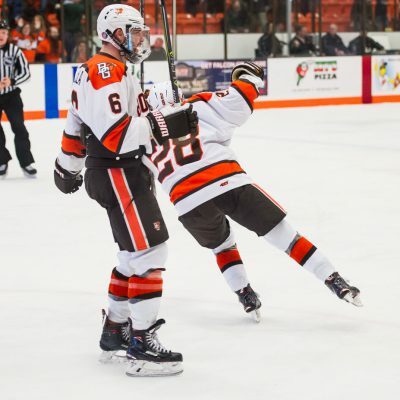 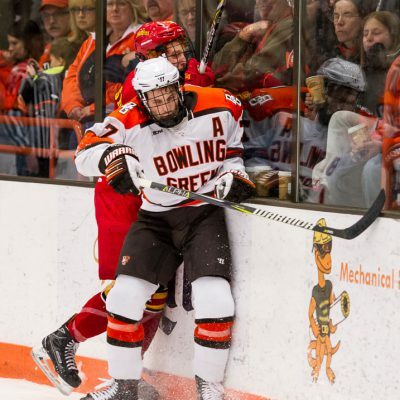 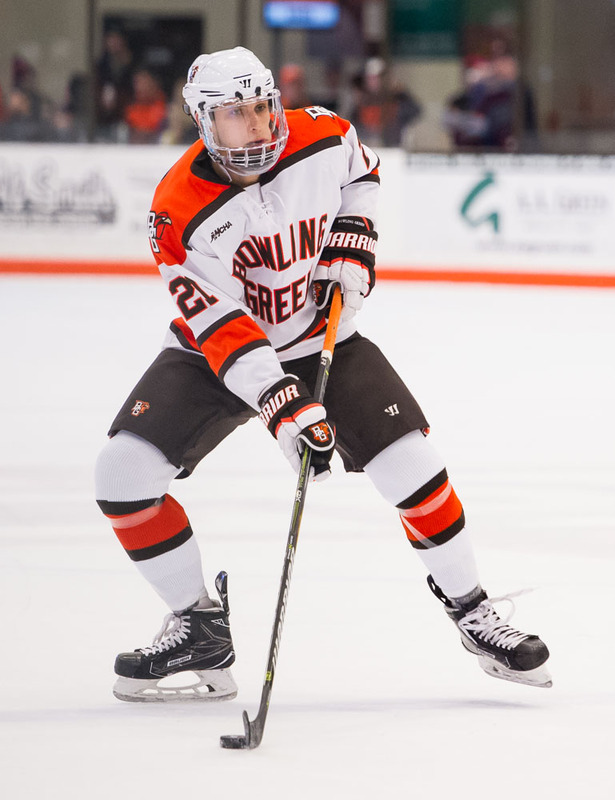 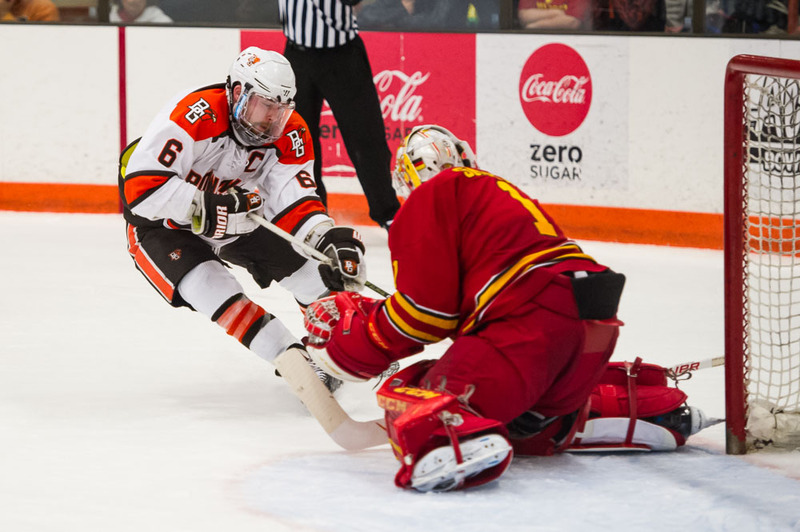 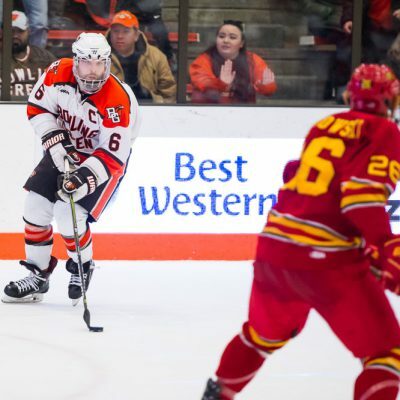 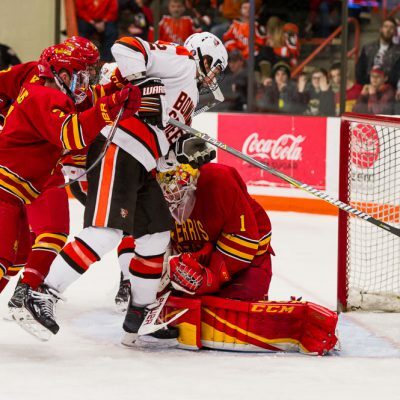 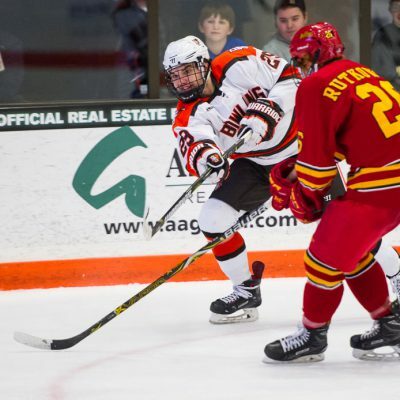 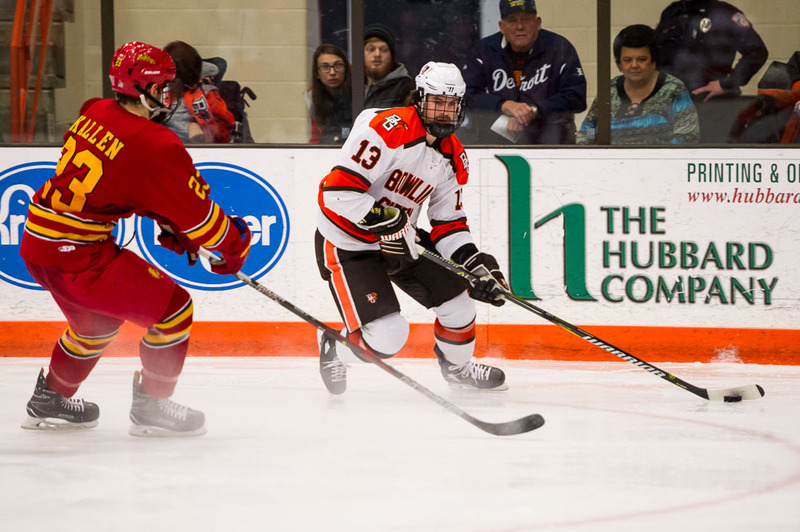 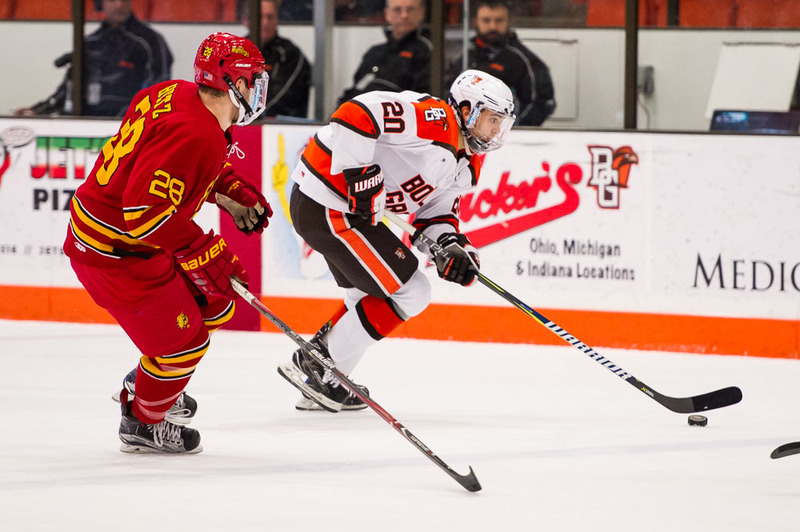 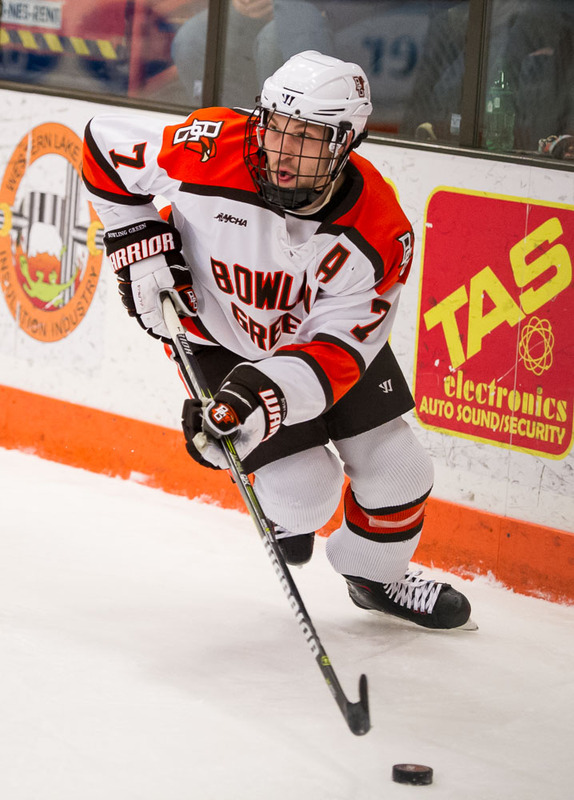 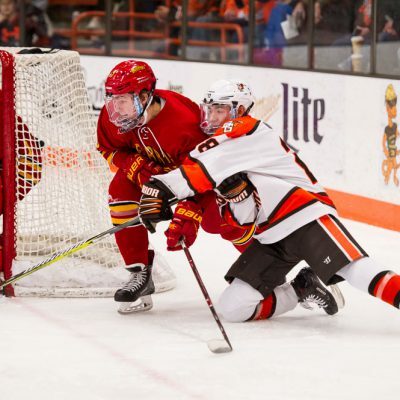 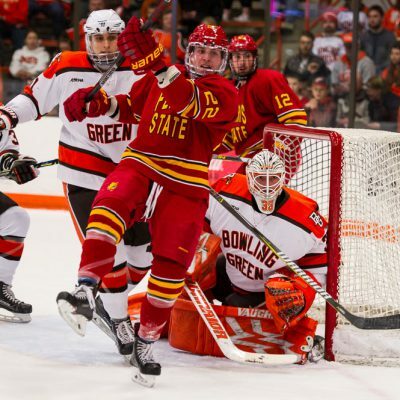 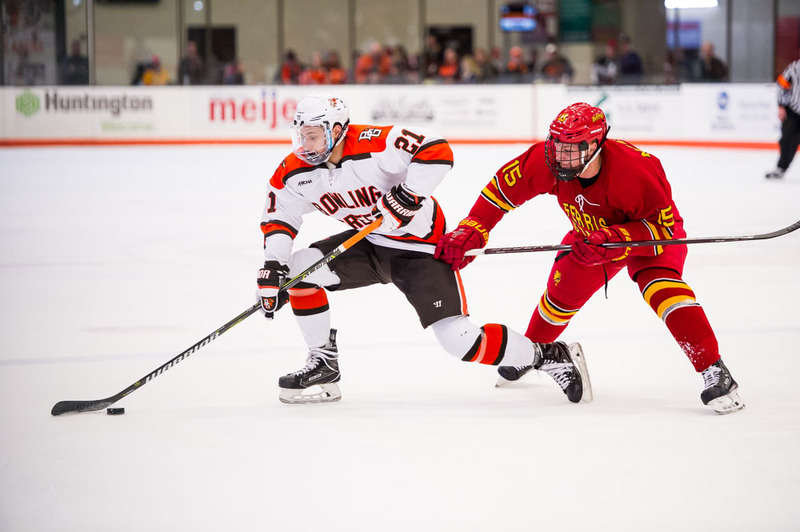 Bowling Green, OH – It took 72 minutes and 64 shots, but the 17th-ranked Bowling Green Falcons were finally able to down Ferris State, 2-1 in overtime, to take the first game of the WCHA Playoffs quarterfinals. 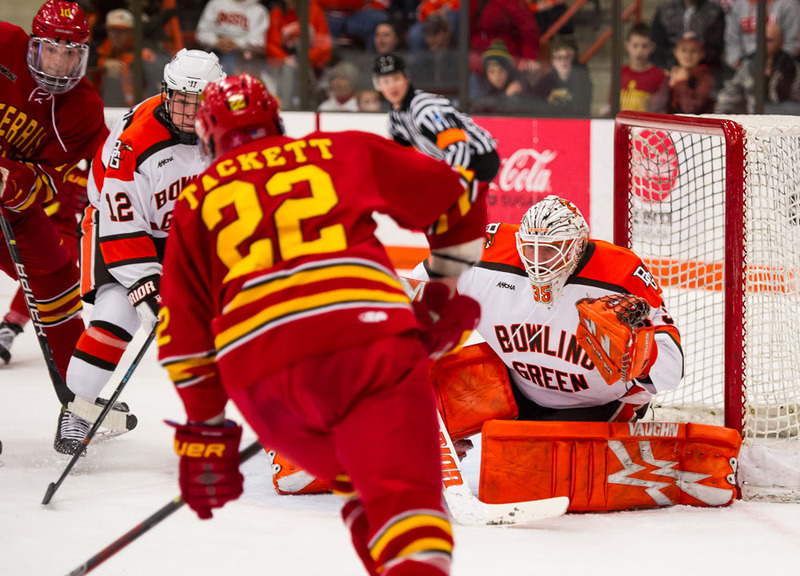 Ryan Bednard started in net for Bowling Green, making 34 saves on 35 shots faced. 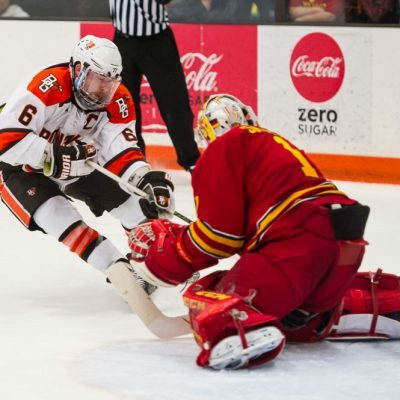 Darren Smith stopped 62 shots on 64 attempts for Ferris State. 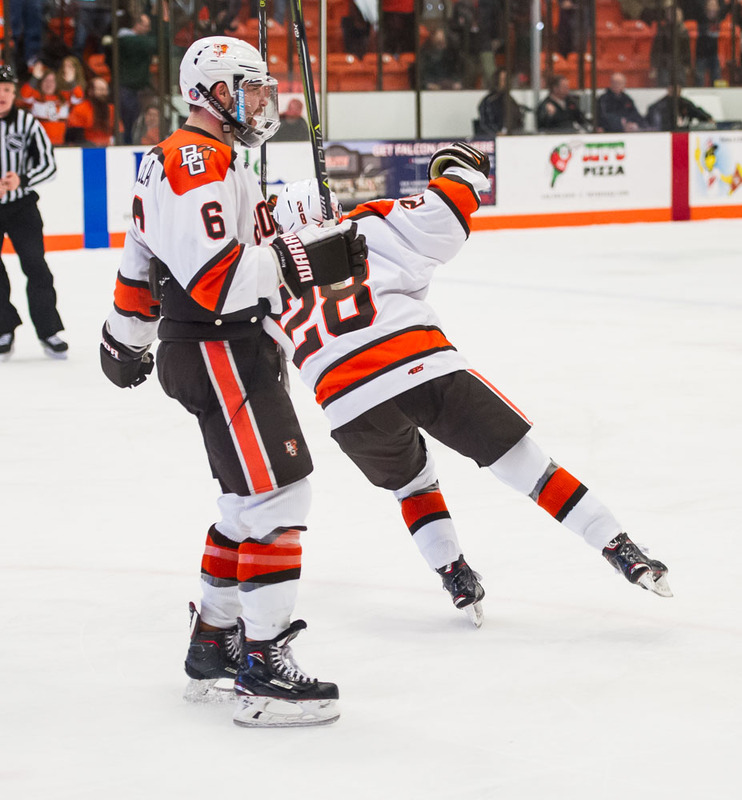 The Falcons struck first at 15:38 of the first period. 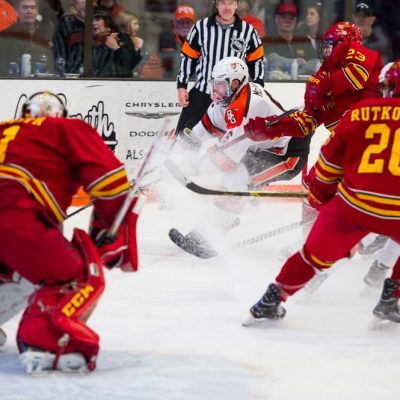 Tyler Spezia and Mitch McLain went into the corner to dig the puck out of the boards. 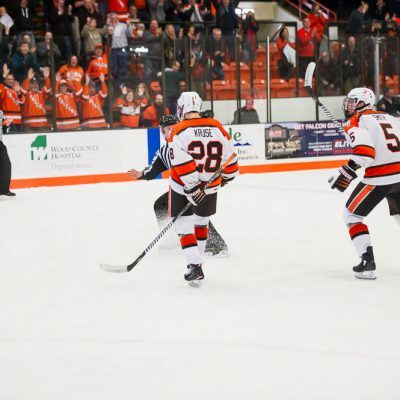 The puck came out and was collected by Brandon Kruse who settled the fluttering rubber and wristed a shot high that beat Smith over his blocker. 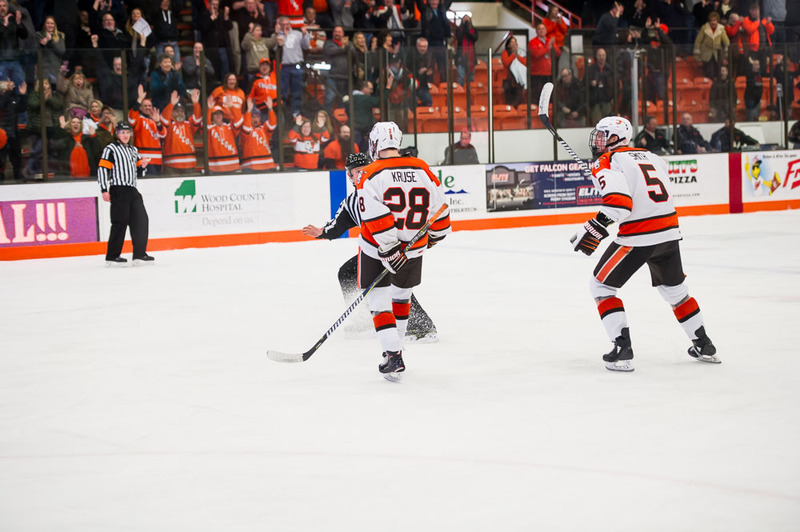 The goal was Kruse’s seventh of the season with McLain and Spezia picked up assists on the play. 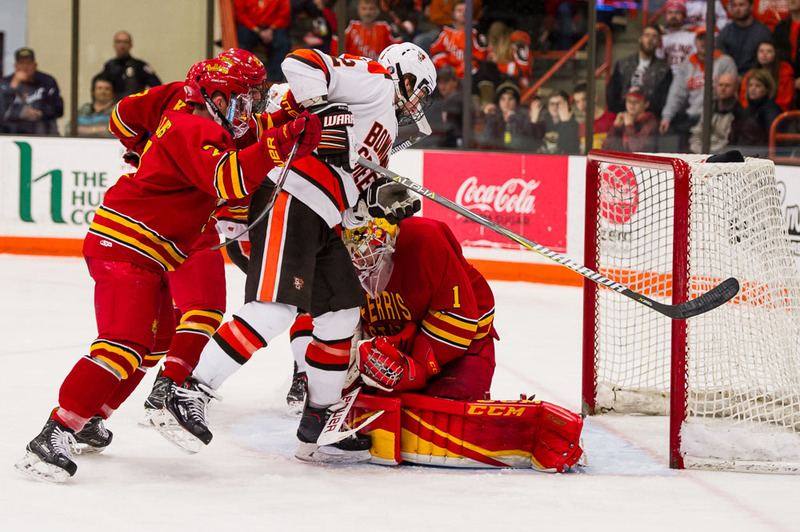 Bowling Green pelted Smith with 21 shots in the opening frame while Bednard was challenged 11 times by Ferris State. 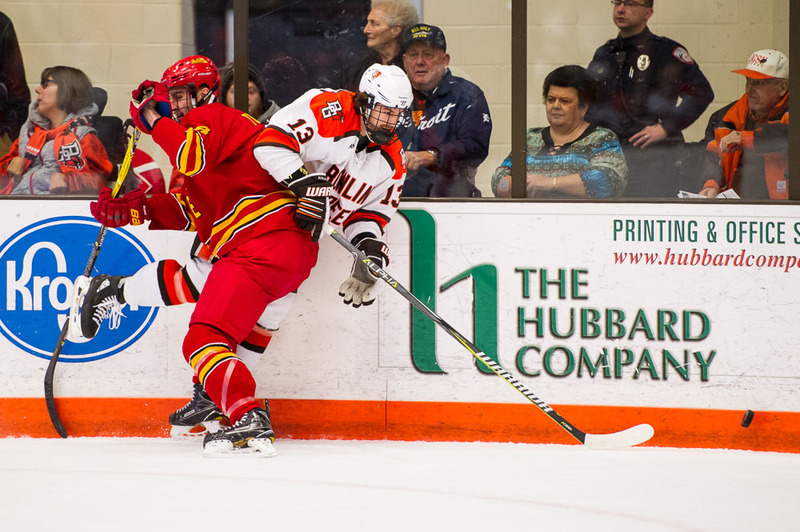 Ferris State tied the game at 15:45 of the second period on the power play. 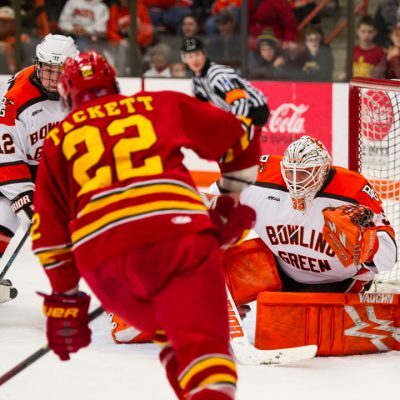 Jason Tackett squeezed shot under Bednard’s pads for the equalizing marker. 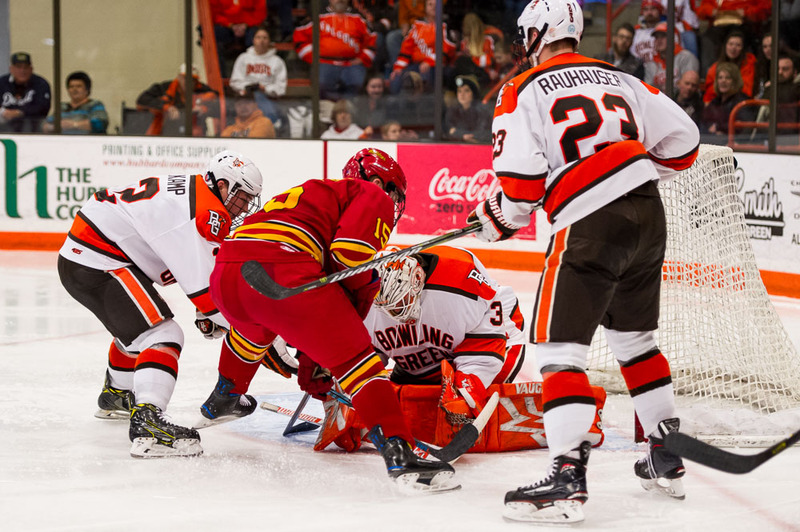 The Falcons had another strong period on the offensive end with 24 shots on net while the Bulldogs had seven chances in the middle frame. 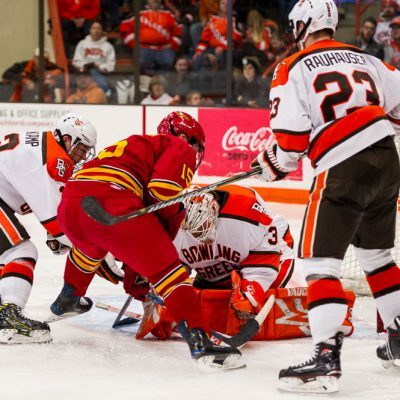 Both teams had power-play chances in the third period of action, but both goaltenders continued their excellent play and forced the game into overtime. 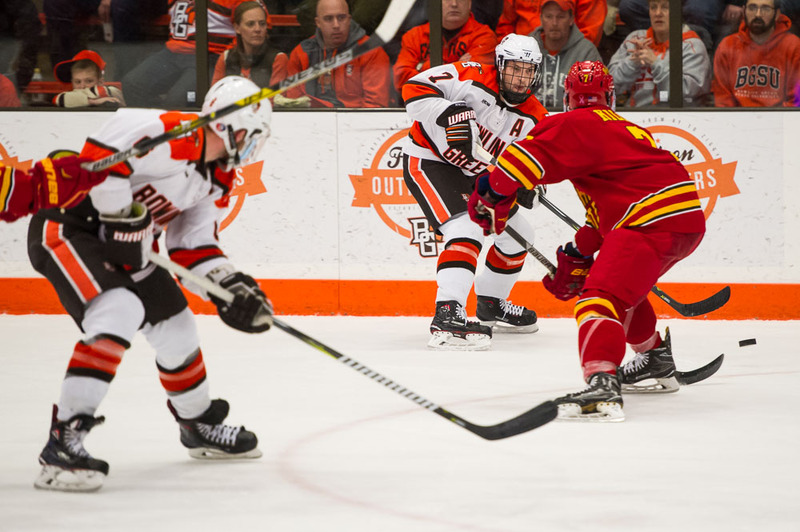 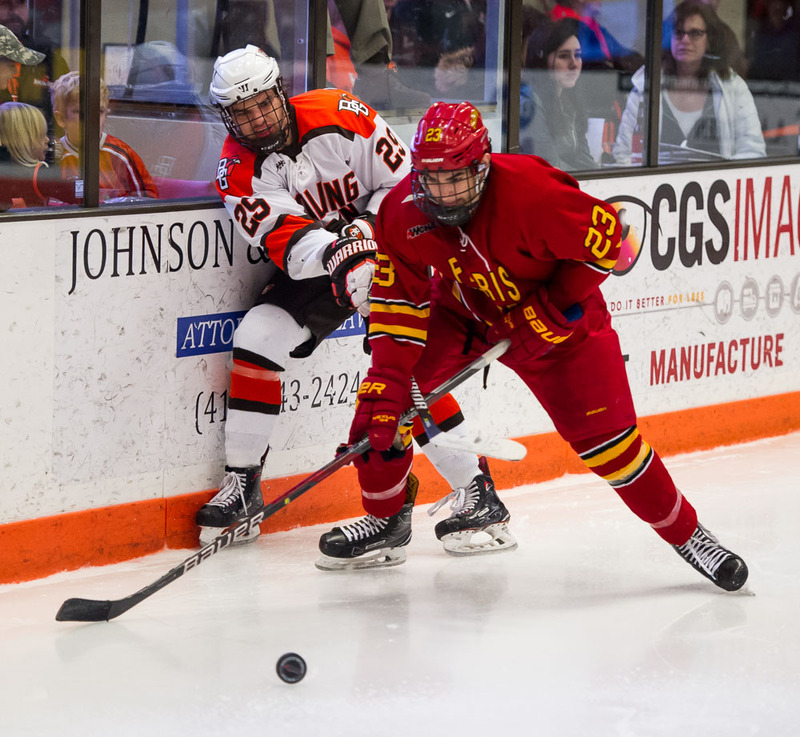 Ferris State had 10 shots in the third period while Bowling Green had nine chances. 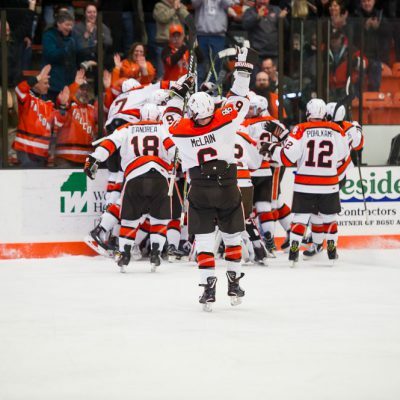 The Falcons were finally able to solve Smith a second time as Brandon Kruse scored the game-winning goal at 7:55. 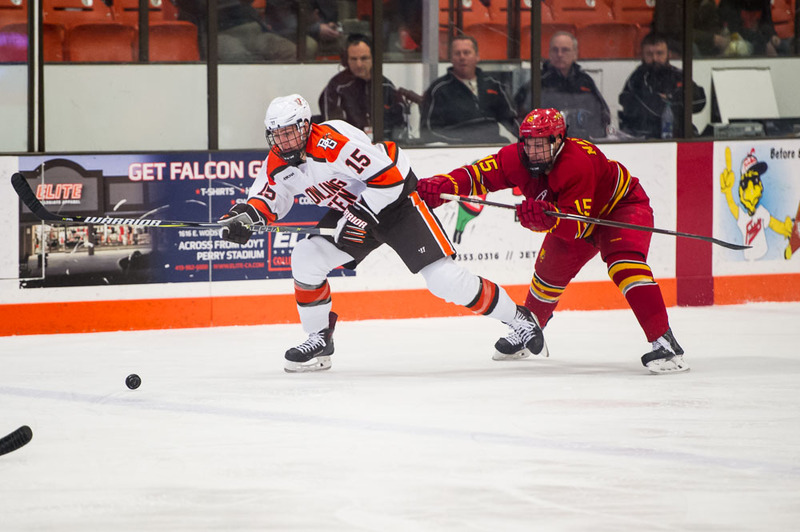 Tyler Spezia forced a turnover in the Falcon defensive zone. 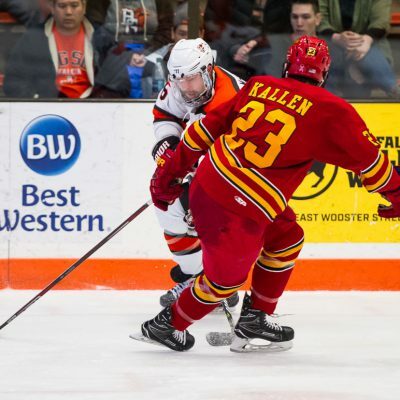 Mitch McLain broke out with the puck and sent an initial shot on net. 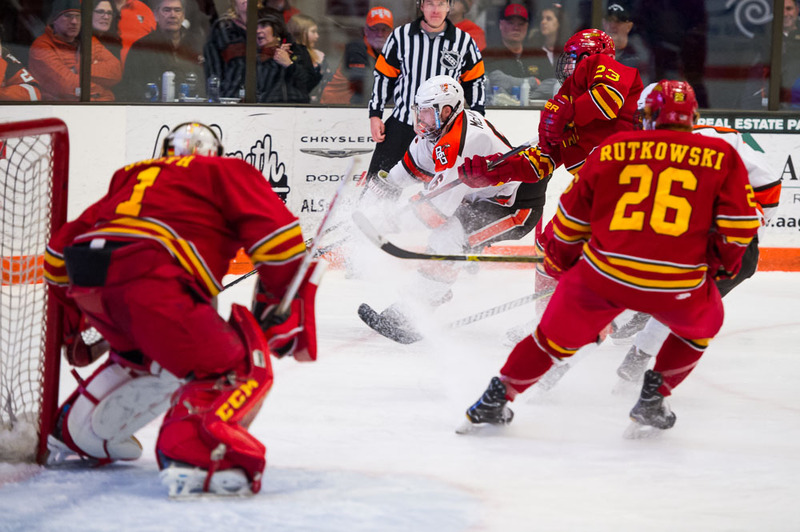 The shot was saved but rebounded to Kruse’s stick, who buried the shot for his eighth goal of the season and second of the night. 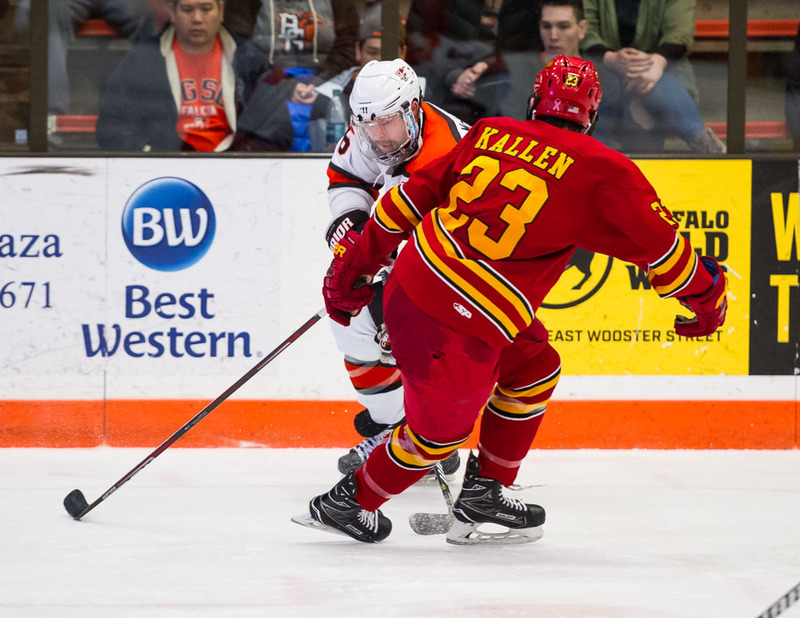 Bowling Green had 10 shots in the overtime period while Ferris State had seven. 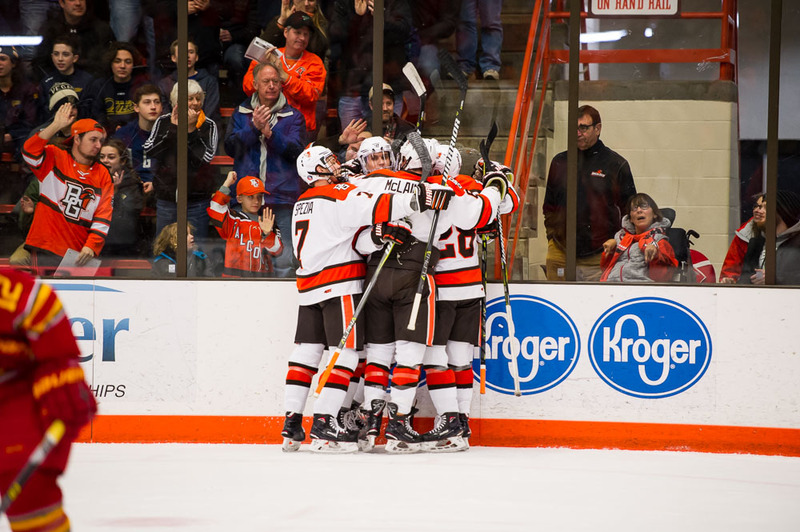 With the win, Bowling Green improves to 21-10-6, 17-6-5-2. 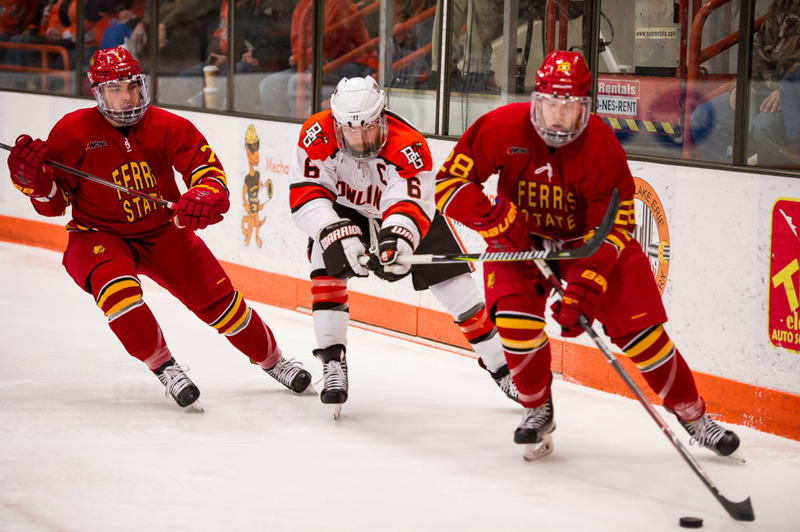 Ferris State falls to 14-22-1, 11-16-1-0 on the season. 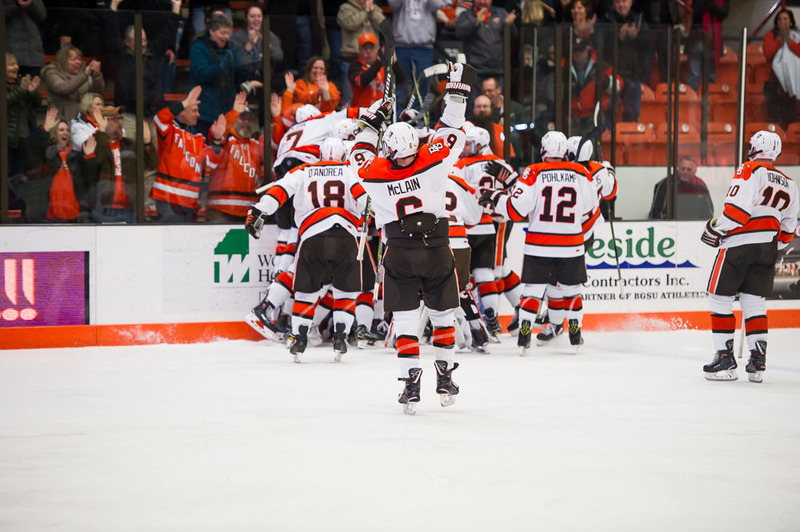 The teams will continue their best-of-three series Saturday at 7:07 PM. 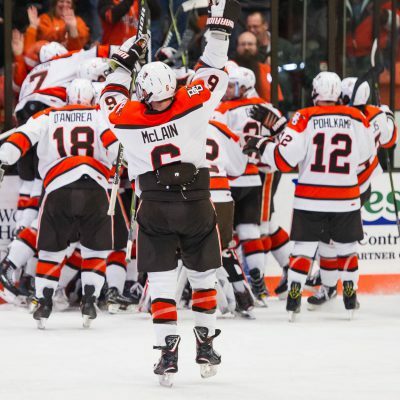 If the Falcons win they will advance to the WCHA Playoffs semifinal round. 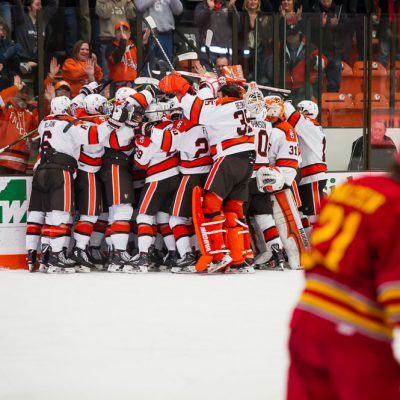 If the Bulldogs win the teams will play a winner-take-all game Sunday at 7:07 PM. 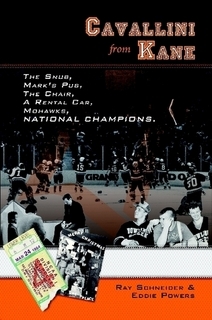 Click/tap on an image for a larger version.